The Cincinnati Reds head to Petco Park on Monday, June 12, 2017 to take on the San Diego Padres. The expected starting pitchers are Bronson Arroyo for the Reds and Luis Perdomo for the Padres. The odds for this matchup have Cincinnati at +102 and San Diego at -112. The Reds have a 35-24-2 over/under mark and a 35-26-0 run line record. The Padres are 28-35-0 against the run line and have a 33-27-3 over/under record. The Reds have a 29-32 overall record this season. Starting pitcher Bronson Arroyo has a 3-4 record with an earned run average of 6.25 and a WHIP of 1.47. He has 40 strikeouts over his 63.1 innings pitched and he's given up 74 hits. He allows 10.5 hits per 9 innings and he has a FIP of 6.87. The bullpen has an earned run average of 3.48 and they have given up 204 base hits on the year. Teams are hitting .223 against the bullpen and they've struck out 227 hitters and walked 102 batters. As a team, Cincinnati allows 8.6 hits per nine innings while striking out 7.5 batters per nine innings. They are 27th in the league in team earned run average at 4.8. 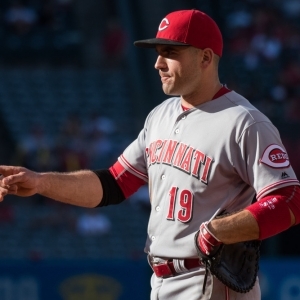 The Reds pitchers collectively have given up 523 base hits and 293 earned runs. They have allowed 93 home runs this season, ranking them 1st in the league. Cincinnati as a pitching staff has walked 233 batters and struck out 456. They have walked 3.8 men per 9 innings while striking out 7.5 per 9. They have a team WHIP of 1.38 and their FIP as a unit is 5.07. As a team Cincinnati is hitting .261, good for 8th in the league. The Reds hold a .452 team slugging percentage and an on-base percentage of .329, which is good for 10th in baseball. They rank 7th in MLB with 9.1 hits per game. Zack Cozart is hitting .337 with an on-base percentage of .424. He has 68 hits this season in 202 at bats with 33 runs batted in. He has a slugging percentage of .594 and an OPS+ of 164. Joey Votto is hitting .303 this year and he has an on-base percentage of .422. He has totaled 66 hits and he has driven in 49 men in 218 at bats. His OPS+ is 165 while his slugging percentage is at .601. The Reds have 556 hits, including 105 doubles and 88 home runs. Cincinnati has walked 195 times so far this season and they have struck out 498 times as a unit. They have left 430 men on base and have a team OPS of .781. They score 5.08 runs per contest and have scored a total of 310 runs this year. San Diego has a 24-39 overall mark this year. With an earned run average of 5.47, Luis Perdomo has a 0-3 record and a 1.45 WHIP. He has 47 strikeouts over the 54.1 innings he's pitched. He's also given up 60 hits. He allows 9.9 hits per nine innings and his FIP stands at 4.41. The bullpen has an earned run average of 5.05 and they have given up 206 base hits on the year. Teams are hitting .239 against the Padres bullpen. Their relievers have struck out 245 batters and walked 104 opposing hitters. As a team, San Diego allows 9.1 hits per nine innings while striking out 8.5 batters per nine innings. They are 29th in the league in team earned run average at 4.98. The Padres pitchers as a team have surrendered 559 base knocks and 307 earned runs this season. They have given up 82 home runs this year, which ranks 8th in Major League Baseball. San Diego as a staff has walked 228 hitters and struck out 524 batters. They give up a walk 3.7 times per 9 innings while they strike out 8.5 per 9. Their team WHIP is 1.42 while their FIP as a staff is 4.52. As a team, they are batting .226, good for 30th in the league. The Padres hold a .377 team slugging percentage and an on-base percentage of .291, which is good for 30th in baseball. They rank 30th in MLB with 7.4 hits per contest. Yangervis Solarte comes into this matchup batting .254 with an OBP of .335. He has 57 hits this year along with 32 RBI in 224 AB's. He maintains a slugging percentage of .362 with an OPS+ of 88. Wil Myers is hitting .261 this season and he has an OBP of .315. He has collected 62 hits in 238 at bats while driving in 31 runs. He has an OPS+ of 110 and a slugging percentage of .479. The Padres as a unit have 469 base hits, including 78 doubles and 72 homers. San Diego has walked 180 times this year and they have struck out on 587 occasions. They have had 396 men left on base and have an OPS of .668. They have scored 3.51 runs per game and totaled 221 runs this season. Who will win tonight's Reds/Padres MLB game against the spread?